A couple of hours ago, Samsung’s USA Facebook page posted up a deal that could land you a free flip cover and set of TecTiles. 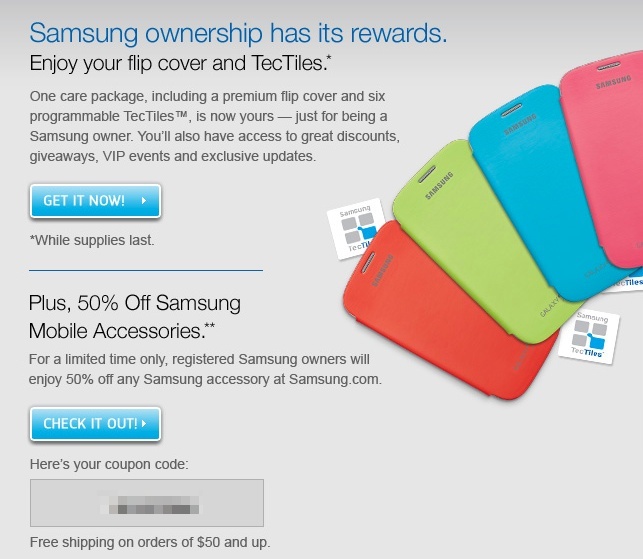 All you have to do is register your Galaxy S3 or Galaxy Note 2 through their Owners Hub Facebook app and they’ll send you an email with instructions on how to claim the freebies. Along with the free goods, they’ll also toss in a coupon code to land you 50% off of accessories. Might want to take them up on this one.